Though originally a send away offer on theReturn Of The Jedi 79 back card, this figure made its carded debut in the United States on The Power Of The Force card, and in Europe on the Tri-Logo card. It was never packaged on a Canadian card. Comments: Unlike the myriad versions we get these days, the vintage line only had one Anakin Skywalker figure (excluding Darth Vader, natch). Still, this one figure was all that was needed, since the dude didn?t do much in the Classic Trilogy other than be dead and smile a lot... Thankfully, the Kenner figure fearlessly brought both of those character traits across very well. Major Variations: Though all vintage figures have minor variations, the Anakin Skywalker action figure has no known variations. There are, however, a small amount (believed to be roughly thirty) of prototype first shot versions moulded in charcoal coloured plastic and lacking date stamps that have made it into the market. The Charcoal Anakin figures, were blistered and clipped off of card backs. 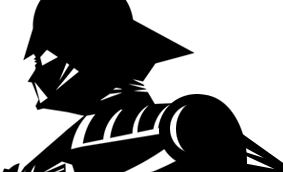 To date, this figure has been found on clipped down 8D8 and Nikto cards. There are no known examples of this prototype being blistered to any other card. 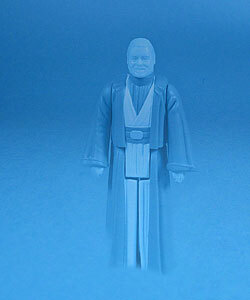 Kenner took a new approach with long robed figures in The Power Of The Force line. Unlike older figures with long robes (The Emperor, Bib Fortuna, Sand People) where the split between the legs was smooth and flush, the sculptors opted instead to mould folds on the inner legs of the Anakin Skywalker and Imperial Dignitary figures. The new design allowed for the same visual aesthetic as the older figures when looking straight on, but when posing these figures in an action pose, they appeared to be in pants.